Most people do not equate building walls with opening doors, but that’s exactly what CrossRoads Missions’ Help Build Hope program does. 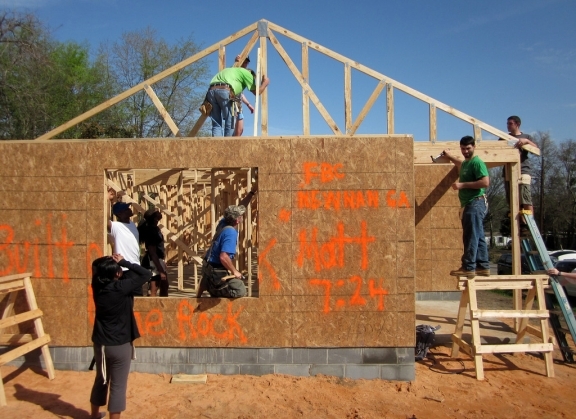 More than 85 Fuller Center for Housing new home builds have been supported by CrossRoads Missions’ Help Build Hope, which gifts walls, materials and financial resources to partnering organizations. A nonprofit, CrossRoads does this not just to support the affordable housing movement but also to help churches put faith into action. “Help Build Hope is a program we created to kind of help the church get its people moved from the pew to participation,” founder Rob Minton said Wednesday. “The goal was that if you can’t get your people to go on a short-term mission trip, we’ll bring the short-term mission trip to you. “The idea behind it is if we can get people to see that their contributions in working together as the body of Christ makes a difference, then hopefully it will move them out of the parking lot, into the local community and eventually nationally and internationally,” he added. Chattahoochee Fuller Center Project Executive Director Kim Roberts said her covenant partner has been blessed by support from CrossRoads and inspired by the messages and Bible verses that often adorn the walls CFCP and other covenant partners have received. But her perspective was enhanced this past Saturday as she saw about 150 youth and adults come together in the parking lot of First Baptist Church in Newnan, Ga., to assemble walls for her group’s 30th home going up this year in Lanett, Ala., birthplace of Fuller Center and Habitat for Humanity founder Millard Fuller. Count Roberts among those who are excited – and not just because the gifts of these walls will reduce the cost of building their 30th home in Lanett. Brenda Barton, communications liaison for The Fuller Center’s U.S. Field Operations, sings the praises of CrossRoads’ support. Since The Fuller Center’s earliest days, she has seen how their support makes construction not only more economical but also makes home ownership even more affordable for the families with which The Fuller Center partners. CrossRoads Missions is marking its 20th anniversary this year – not bad for an organization founded by someone who went to Milligan College in east Tennessee with other plans. They decided that the best way to keep the work going was to encourage Minton to keep leading it. And for more than seven years, Fuller Center volunteers have raised walls provided by Help Build Hope and have seen the many inspirational inscriptions upon them, penned by people CrossRoads has successfully helped move from pews to participation. Newnan Times-Herald coverage of Help Build Hope at First Baptist Church. Learn more about CrossRoads Missions on their website.